This Amish Mission Dining Chair possesses clear Mission style elements with a distinct contemporary twist. Unique elements include contoured slats and the extra stretchers crown which provides both additional style and support. Your dining room will look extra sharp when you pair a set of these chairs with our Amish Shaker Dining Room Table or our Monterey Mission Dining Table. 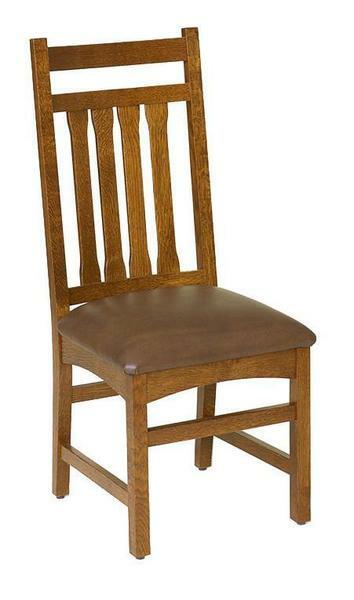 The Mission Dining Chair comes standard, and is a favorite, in Oak wood. Other available woods include Cherry and Quarter Sawn White Oak. Customize this beauty to the max with a wide variety of stains, paints and distresses. Discuss your options with a live Amish furniture specialist, happy to help you make these chairs right at home in your space! 1-866-272-6773.